…and as I remind the girls every year, I don’t just mean the young men who lost their lives. The civilians too. The Girlguiding members whose childhoods were taken by war. The ones who died trying to save the lives of others. The ones who continued Guiding in secret when their organisation was banned. The ones who kept people’s spirits up and used all they’d learned to help each other survive while interred in prisoner of war camps in the Far East. I will continue to teach about how Olave Baden-Powell urged girls to work for peace rather than war. How Robert Baden-Powell tried to encourage international friendship to prevent hate against one nationality to another. There’s a fantastic book written by Janie Hampton called How The Girl Guides Won The War that I highly recommend. I’ve had to buy a new copy as mine has been borrowed so often I don’t know who has it anymore. Our library is now up and running, with the Senior Section giving ongoing requests for books to add to our bookcase. Over the easter holidays, most of the girls took books or films home and a few of them wrote up reviews for their blog at our last meeting. We had a little bit of chat about one of the books that many had requested, Thirteen Reasons Why as over the holidays a Netflix series based on the book was released and has caused quite a lot of controversy. I was intrigued because the girls had mentioned the book so many times, plus I’ve been a long time supporter of the charity To Write Love On Her Arms which raises awareness of mental health. I did have concerns about the show as the episodes went on though. A friend asked me my opinion after seeing some articles about it on social media and I advised her not to watch for fear certain scenes would be a trigger for her. Several of our members have been watching the series – as I know many teens have (several of young people who I have known from surf camp, as well as teen sons and daughters of my friends have posted about it on social media). I think that the post that Jamie Tworkowski (founder of To Write Love On Her Arms) has written in response to the show is a measured and sensible one. And the TV series for sure has taken quite a few liberties from the original story in the book. I’m guessing for ‘dramatic’ effect (and I suspect, reason to create a Season 2). Anyway, if you are interested in our members’ opinions on books and films they have been reading and watching you can find them over on their blog. They are doing this as part of their Phase 2 or Phase 3 of Personal Values octant. The next month sees us in school exam season, so we will be having some chilled out nights with less serious discussion I imagine! 🙂 We shall see. The girls decided they wanted to do something for International Women’s Day, and I guess because of the library have been thinking more about inspiring women of late. So they suggested that we all come to the meeting (myself as well) with a woman that inspired us. We each chose a decade/era so that no one would have the same woman or group of women, and we came prepared to share about our women. I think the idea was to dress up as well, but none of us ended up doing that! They also decided to use their research to create a timeline of women’s history. It was by no means all inclusive – there’s just so much we could add. All our chosen women were of course main features, and from some of the books which they had requested and arrived in time for that meeting like Rad Women Worldwide had female historical figures they decided to add. We got distracted by putting our library together the night they planned to do this, so it was only last week that it finally got finished. 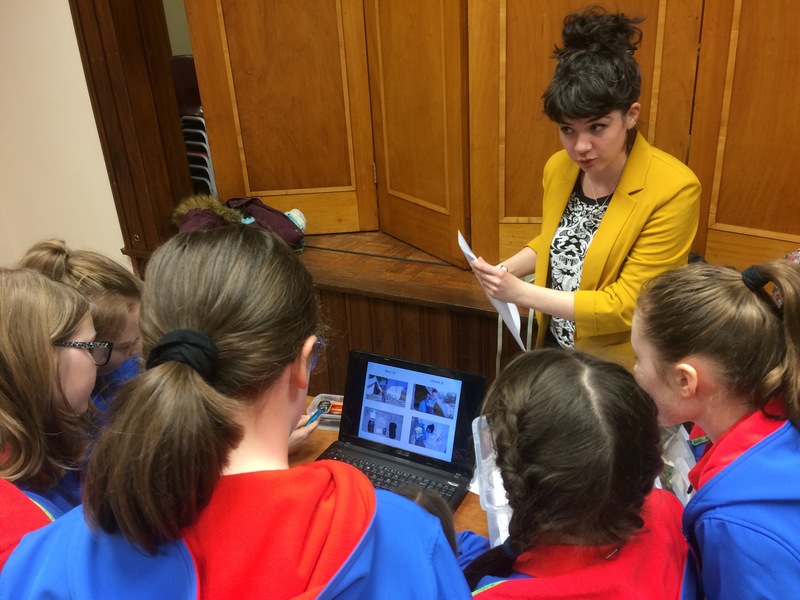 I left them to it, chatting to girls about their Look Wider books, and lending out my laptop to some of the girls who were taking turns to use it to write blog reviews on books and films they read/watched over the Easter holidays. Sometimes I worry with activities like this that it might be too much like schoolwork. But as it came from them, I didn’t get concerned about it. And actually it’s inspired me more to get back involved with sharing women’s history and making it better known. The simple fact is we don’t get these history lessons in school. They also seemed to be invested in the project, and satisified with the end result. …what have we done? I know a lot of Senior Section leaders say they “don’t get it” or aren’t sure how to plan a programme. It is hard work, but once your girls get it, you will find that they come up with so many ideas. The great thing about Look Wider is that it is so flexible. I think that can be intimidating for members who have been used to a fairly firm structure (both unit members and their leaders). But it doesn’t need to be intimidating. If your members are really struggling for ideas, then go seek around the world loads of examples of what others have done – they might like the ideas, it might inspire somehing else. Do a game like the one Kelloggsville invented to get more ideas. Ask the girls pertinent questions and give them time and space to think on them. Then support them to use their answers to base your programme on over a longer period. Over the last 5 years our group has been running we’ve done a range of things.At times we have been limited by the availability of the girls, and the fact that I don’t always have access to a car. Some activities have become traditions that the girls want to do over and over. And some nights it’s just been about chilling and having fun – especially when the girls are on exam leave. These are just things we have done together in our meetings. This does not include what individuals have done as Young Leaders/Adult leaders in training, or during their own time outside of Girlguiding/School/Work/University/College which they can also count as part of Look Wider. All of these activities we have done during our meeting times, with the exception of a few things (such as Remembrance Sunday, Color Me Rad 5k, opening of Parliament and the Build A Bear Party which we did on a Sunday morning before the shop opened). Some were away from our regular meeting place, but done during our meeting time. Creating a Community Map with photos identifying needs and focal points for the local area. Unit Scrapbooking (we have kept scrapbooks of all our activities as a unit since the beginning). Making the invitaitions for a ‘invite a friend to Brownies’ Easter party. Decorating mugs while blasting the Christmas music…and eating popcorn! Letting them pour buckets of ice and water over the Adult Leaders for the MND ice bucket challenge. Celebrating the end of exams with a pyjama party. One of the girls kidnapped my camera and snapped this of me. Thanks for that!! The Promise Tree. The discussion that came along with doing this was what made us think Girlguiding UK had been bugging our meetings. We were so happy to hear about the Promise Consultation and all of us took part in January. Helping out at local summer fair to fundraise for our Division. End of year campfire with some other Senior Section members. Learning about Diwali – each one of us found out something about Diwali and brought something along to celebrate it! This – making lanterns! Laying the Girlguiding poppy wreath at the local cenotaph. Last item on the to-do list for one of our BP girls – doing a fundraiser for Scottish Love in Action. The Senior Section unit helped by decorating glass jars that we filled with sweet treats to sell. You might remember a while ago, I mentioned how the Ranger group decided to start their own library. Before last summer, we purchased an ikea bookcase which the girls built (and decorated). They call it the ‘Hawaiian bookshelf’. They requested a couple of books and films last year – we had two film nights to watch the DVDs we purchased for the library when they came out. And then they got distracted by other activities…until we asked the question ‘If you could change anything about the world…’ and every single member wrote down equality for women and equality in general. The girls had struggled to come up with more than about 3 or 4 book/film suggestions for the library at the start. Over the last month, I’ve taken a pile of books I had for other projects and from my own bookshelves to meetings to let the girls look through, and from there the girls have also given me more for their list of what they’d like to be included. At least one I think went off and did some book buying research! We have a mixture of fiction and non-fiction books and some films with the idea that the content of them will help us learn and think about our stance on a variety of social issues. This will hopefully help them fulfil requirements for their Personal Values octant. They have scheduled a Book club night for our last meeting of this term, and the hope is to take away a book or film over the Easter Holidays and do a little review of it for their blog. They also want to finish their International Women’s Day activity – as they got a little distracted last time looking at the books. Particularly Rad Women Worldwide (a new book published very recently). *both of these books are the Young Adult versions, mainly as I found the original I Am Malala book quite difficult to follow myself as it seemed like it had been edited poorly, I suspect in a rush to publish her story. My friend who studied Children’s Literature and Literacy (and a fellow bookworm) also had a similar struggle when reading the book when it first came out. I don’t know if the latest adult edition has corrected to rectify some of the grammar and sentence structures to make it more readable. It may be we will get both the original and young adult editions depending on feedback from the Rangers. There are some books I suggested or took down in the piles that I was surprised they didn’t want (such as Malorie Blackman’s Noughts and Crosses series, which was very popular with my younger sister and some of my ‘graduated’ Rangers). They actually told me they really didn’t want certain books, and most of the time it is because they now hate them having been forced to analyse every inch of their pages at school. Ugh. It’s a real shame but I also understand. I’m constantly having to remind them not to put that pressure on when they have decided on a project like this…that we are not marking the work they’ve put in, it doesn’t have be done any particular way. The whole point is learning and enjoying the process of thinking, discovering and sharing that with others. We shall see how this idea develops…they are certainly getting me reading more! Thanks to my friends from the Women of Colour Feminism Conference, A Mighty Girl website and The Book Fairies for giving me some suggestions of books to take along when the girls were struggling for book ideas at first. One of our Senior Section has been involved in a campaign with some young people from her high school to ask Scotland to do more to welcome refugees seeking sanctuary here in the UK. While planning for the term, they asked if we could learn more, so I told them about my friend Katherine who had not long started working for a small charity called the Refugee Survival Trust. One of the things that Katherine and the volunteers at RST do is go into schools and groups to help dispel myths and help educate people about what the reality is like for refugees and asylum seekers. Thinking Day seemed like a good day to learn about such things, so we invited Katherine to come through for that week. And then the Guide unit that meet at the same time as us said they had no current plans for Thinking Day so we decided to join up with them. If you are a unit based in Central Scotland, particularly if you’re in the Glasgow area where most of the RST volunteers are based, I totally recommend getting in touch with them and inviting them to come talk to your unit. Maybe your unit could even do some fundraising for them? Thank you so much Katherine for making the time and effort to come through to spend the evening with us. We really appreciated it! One of our youngest Guides told me that she thought a great way of serving our communities was smiling at people and putting happiness into the world and that really got me thinking. Miss Val* has talked a lot about choosing to be grateful for the privileges we have. Over New Year I’d been thinking about the amount I get grumpy about what I don’t have rather than finding joy in the nice things that happen. And so I gave each of the girls a jar (and I bought one for myself) and told them that these were for them to use how they wished – my idea is to put notes of all the good things that happen in. However, they could choose to use it differently – either to hold notes of things they are thankful for, good things that happen, good ideas for positivity…. The girls decorated them, and I loved watching their creativity in doing so! They’ve said they’d like to maybe bring them in later in the year so we can share all the positivity, joy and gratitude stories they contain. I’m all for that!